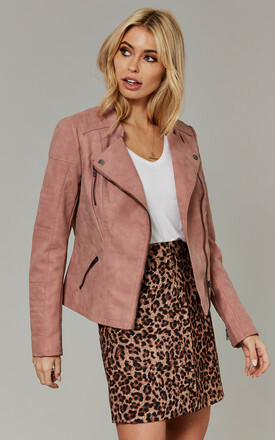 This ash rose biker jacket has tough quality with a touch of femininity. The classic style features a smooth inner-lining, pockets and contemporary zip detailing, creating the cherry on top of all your everyday outfits. This jacket gives your silhouette a bit more shape if you feel like your top isn't doing the trick. Wear it with anything from a detailed blouse, a tank top or a plain white tee. Add some denim jeans, a pencil skirt or black trousers and throw on shoes of your choice. Perfect for layering as it's thick enough to keep you warm but doesn't look bulky and is easy to move in. Plus, since you can style is casual or dressed up, you can wear this jacket for so many different occasions, it's money well-spent.